Putting aside all talk of the queerbaiting, sexism, and racism that is the show’s standard and now expected fare, I’d like to talk about Sherlock’s return. We’ve been told that the first episode, The Empty Hearse, will concern Sherlock Holmes (Benedict Cumberbatch)’s “return from the dead”, his being united with assistant-slash-flatmate-slash-blessed-with-saintly-patience-friend John Watson (Martin Freeman), and the long-awaited explanation of how he survived. And you’d expect that, wouldn’t you. 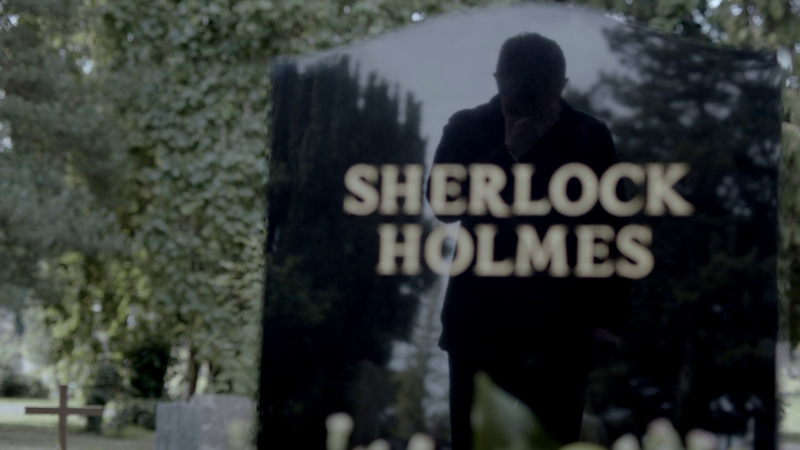 The show can hardly function without its eponymous protagonist, and an emotional reunion scene between the two men is what fans have been longing for since The Reichenbach Fall first aired. However, there is something wrong with this forgiveness plotline. This is not a problem that can be fixed quickly, perhaps at all. And the writers of Sherlock seem to believe it can be. At the end of The Reichenbach Fall, Sherlock knows that in order to defeat Moriarty, and in order to put himself in a position to be able to take down the remaining threads of Moriarty’s web, he has to make it look like his only way out is to kill himself. With snipers trained on the people he loves, he knows he has to make it look like he died in order to save them. He says a heartfelt and believable farewell to John from the roof of the building before, supposedly, jumping to his death. This was a game, of course, and as the audience later finds out, Sherlock, presumably with the help of Molly Hooper, survived. John Watson doesn’t know that. John Watson thinks he watches his best friend commit suicide. John Watson thinks his best friend is dead. John Watson believes, at least in part, that it was his fault. That there were things, as he confirms to his therapist, that he could have said and didn’t. This, unfortunately, is how this particular kind of trauma works. If a loved one kills themself, in any situation, we are bound to ask ourselves “why? What could I have done differently? Could I have stopped this from happening?” For John, who’s suffered trauma and PTSD before, and who saw this happen before his eyes, these feelings will be particularly severe. And this was all part of the game, for Sherlock. Who would have known, presumably, in his infinite wisdom, the kind of effect this would have. Do you see where I’m going with this yet? This was an already incredibly traumatic thing for someone to go through. For that person you watched dying to come back? To find out that person had in fact faked the death that so plagued you, and that everything you felt as a result of that was horribly, confusingly, not real? That’s absolutely terrifying. That said, audiences of Sherlock have in fact recognised that that experience was and will be incredibly traumatic for John. That’s not the problem. The problem is that we know, even now, that the show won’t. We know that the first episode (and that episode alone, apparently) will deal with Sherlock’s return and that the reunion will be “long and emotional and extremely funny”. We also know from promo shots that John will punch Sherlock in the face when he comes back. In promos and teaser videos we’ve seen Sherlock be flippant about his return to John, make fun of John’s moustache, turn his life without Sherlock into some egotistical joke. “What life?” he asks, when a suddenly protective Mycroft informs him that John has moved on, and away from Baker Street, “I’ve been away”. (0:22) It’s a sick mockery of what we know and have been told is the case—John’s life, for a long while, after Sherlock’s “death”, was not easy. The focus of the episode, presumably, and the source of the most anticipation, will be explanations of how Sherlock managed to survive the fall. Yet we’ve also heard John say “I don’t care how you did it, I want to know why” (above video, 0:07). He wants to know why, not how, his best friend could break his trust that way and leave him the way he did for two years. Promo shots and video also lead me to believe that Sherlock will in fact reveal himself to John in a restaurant—in a public place, as if the distress John will be feeling weren’t enough as it is that he needs to be publically humiliated while they’re at it. In the Christmas mini-episode, Many Happy Returns, Lestrade presents John with a video from Sherlock—in which Sherlock insults John, saying his friends all hate him, which John on his blog calls Sherlock being “funny”, and “human” (I’m just saying, all signs point to emotional abuse). John, here, is clearly not over the tragedy of watching his best friend die—which is understandable, if concerning. In fact, in that blog entry he makes an explicit decision to move on completely. Yet we also know that the second episode, The Sign of Three, features John’s wedding to Mary, at which Sherlock is the best man (part of a clip of his best man speech was also played at ComicCon this year). It takes John two years to start being able to reconcile with Sherlock’s death, and yet he would be able to reconcile with Sherlock’s manipulation in a couple of months and ask Sherlock to be his best man? John could learn trust him again, in that short a period of time? Again, we’ve been told the episode will be “extremely funny”. I cannot say enough how there is nothing about this plotline that is funny. Allow characters to make humour out of their own grief, sure, that’s human. But to make any element of this plot comedic is sick and belittles the emotional impact of it. Keep in mind, also, that this is not the first time we’ve seen Sherlock manipulate John. In The Hound of Baskerville Sherlock actually drugs his best friend, unwittingly and without consent, in order that he might solve a case. Is it ever brought up that Sherlock was way, impossibly way out of line in doing that? Nope. How many other times have we seen John (or Molly, or Lestrade) brush off something cruel or manipulative Sherlock has said, because he “saved the day”? What will John’s reaction be like the next time Sherlock tries to manipulate him for a case, now that there’s this huge rift of mistrust between them? This is not even the first time Steven Moffat has told this story. He’s done it in Doctor Who—in the finale of season 6, the Doctor fakes his own suicide in order to save the universe, once again, leaving his companions convinced that they could have saved him but failed. In the following Christmas episode he shows up at Amy and Rory’s doorstep unannounced, expecting–and receiving–full forgiveness for his manipulation. The Doctor never pays for lying, for playing the emotions of those dearest to him. He never has to. Irene Adler, too, had a clever explanation for why she wasn’t dead and a snarky yet playful way of announcing her Not-Deadness to Sherlock—casually brushing over the trauma Sherlock himself was caused over six or so months, under the impression that she was dead and it was, at least in part, his fault. In fact, Moffat has been shown to have a habit of writing characters who ask too much of people, who manipulate people “for the greater good” (or sometimes just for their own gain), who both reel people in and push them away. He writes abusive characters, is what I’m saying, which would be all well and good if he’d ever say that what they’re doing is wrong. These characters, like Sherlock Holmes, are never reprimanded or narratively punished for—we’re told they’re our Hero, that whatever trauma they’ve inflicted is justifiable despite it hurting the people around them, sometimes irreparably. If you’re going to tell stories like these about abuse or manipulation or trauma, there is a certain amount of responsibility you must take to treat these delicate and triggering subjects with respect, and give them the complexity they would have in the real world. As a writer you have a responsibility to your characters, whether in universe or outside of it, to at the very least show that the abuse or treatment they have received was wrong. Because you also have a responsibility and a duty to your audience to show that abuse is wrong. And the audience can’t see that if you let abusive characters off easily. The fact is that Steven Moffat does not write realistically in writing these plots and the reactions of his characters to what is often, well, really quite disturbing emotional abuse. Certainly, it’s the kind of treatment which would result in an enormous loss of trust between the characters in question. But in Moffat’s world, it never does. Those kinds of emotions don’t matter to Moffat, see. The same way they don’t matter to our tragic and heroic protagonist Sherlock Holmes. In the final moments of The Reichenbach Fall, we watch John say a heartwrenchingly honest goodbye to Sherlock. For the first time since his best friend killed himself; for, perhaps, the first time in the series, we see him lose his cool completely and break down. 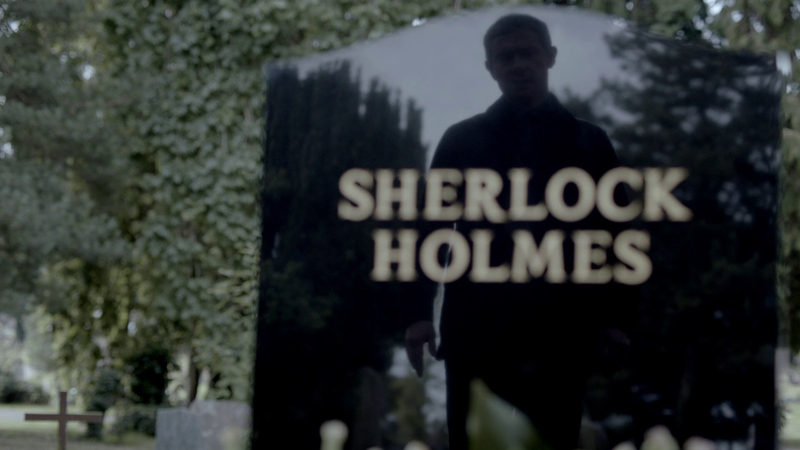 The camera is trained on the shiny black marble of Sherlock’s gravestone, but the focus is on the reflection of John we see in it. It’s Sherlock, but it’s about John. What happens next, is we see him piece himself back together, set his shoulders, and walk away–a broken man, but not defeated. It’s a beautiful moment of television, one of my favourites. What follows it is one of my least. 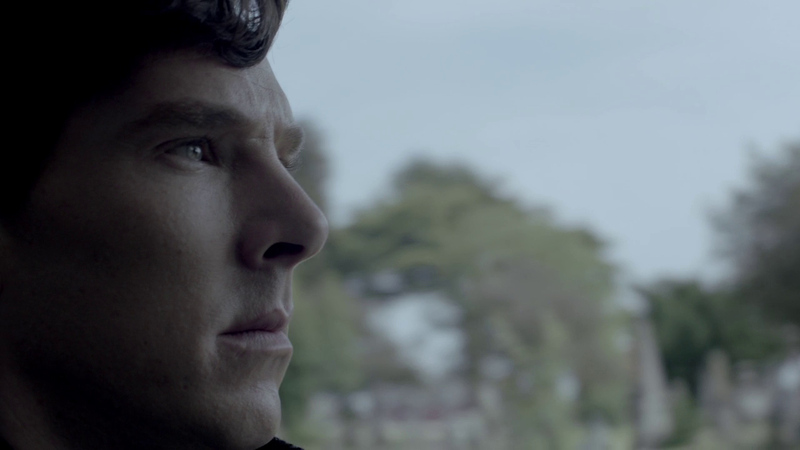 After John walks away, we pan to Sherlock Holmes looking moodily into the distance. Again. I cannot state any more emphatically that this plotline was not about Sherlock. It should not have been about Sherlock. It should have been about John processing a horrific experience and learning to live with the knowledge of it. And season three should be about Sherlock’s unfeeling and self serving actions affect John, and the people around him, about the complex and difficult emotions, their inability to trust this person, as much as they might love him, because of what he did. And none of that is an easy story tell, so maybe Moffat wasn’t up to it. We know he’s no good at writing about grief, or death, much preferring to have a clever answer for it. However, what that means is that maybe he shouldn’t be trying to tell the story in the first place. I know that the show is called Sherlock, that it doesn’t function without him. I know that the Reichenbach story is crucial to the Holmes canon, and why do a reboot if you weren’t going to tell that story. I know that the show can’t progress in its primary plots if John doesn’t “get over it” and forgive Sherlock quickly, that this short seasons of three episodes would be “bogged down” if John spent too much of it, y’know, having emotions that mattered. I know an audience doesn’t want to watch something that hard and painful, something that can’t be fixed quickly. I know fans want that punch as much for the comedic value as for the emotional. I know fans want to see John and Sherlock friends again as soon as possible. I know it’s Just Television, why do I care so much. But there’s a large part of me that wants to see Sherlock pay, really pay, for his actions, and for thinking people can be as disposable and usable as that. What I want is to see and feel that palpable rift between them. 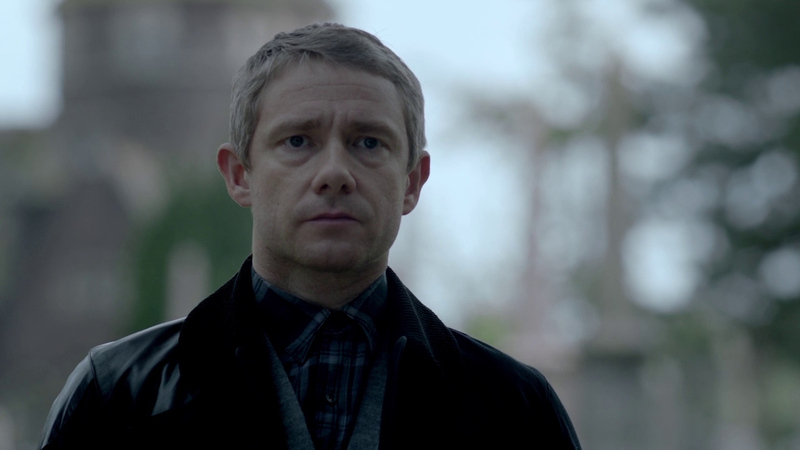 I want to see and feel John Watson’s rage and hurt and distrust. I want Sherlock to be honest to god sorry he did it, when he sees what happens when you play with something until it shatters. It’s a want that lives in a lot of other Sherlock fans. Am I saying Sherlock was wrong to try and save his friends? Of course not. But hero or not, you can’t get away with breaking someone’s trust like that. There were alternatives to letting them believe he was dead for years. There are alternatives that didn’t involve keeping this from John for two years, potentially irreparably breaking his trust. There are so many alternatives, that I simply can’t abide the notion that this was “Sherlock’s only option”. Sherlock Holmes himself has said he’s not a hero, and we didn’t believe him because John didn’t believe him (or, perhaps, because we’ve been positioned to see his kind in that role). But, just like John, we’ve been swindled by Moffat into believing that Sherlock Holmes is a good and true person, and that the terrible things he does have a reasonable excuse. We all know that Steven Moffat likes being clever, likes to tell stories that exhibit the intelligence of their creator as well as the characters, and that’s fine. It’s fine to want to tell stories like that. But it’s Not Fine to tell them irresponsibly. To fetishise suicide, to excuse abusive behaviour with a hand wave and a clever remark. To forget about the feelings of the survivors of trauma. why did you make him watch. Sherlock returns on the 1st of January in the UK, on BBC1. I don’t really think that john is getting “over it” that quickly. This post is kind of under the assumption that they wont show more of the characters reactions, but i don’t think thats true. Both sherlock and John seem traumatized, even at the end. Sherlock seemed a lot more hesitant, especially during the fake jack the ripper case. John also thinking sherlock was in a disguise seemed like something out of the shock of seeing his friend again. What sherlock did was horrible, but i don’t think it warrants an entire season (which we all know will be painfully short) of watching him be “punished”, his time spent away from the people he loved seemed like enough. Yes sherlock is manipulative, but I think John has enough power in the relationship to tell him when enough is enough. Also, i doubt john really cared enough the be humiliated at the restaurant. Out of curiosity what part did you find racist? 1. Moffat didn’t write The Reichenbach Fall or The Empty Hearse. Please do your research and see that you can’t just pin responsibility on one person. 2. Sherlock isn’t faking his death to hurt John, he’s doing it to call off the snipers with guns aimed at his three favourite people. What would you do? 3. Molly Hudson? Please, if you’re going to have an opinion, at least watch the show and pay attention. Molly Hooper. Mrs. Hudson. One does post mortems and the other is not their housekeeper. Not trying to be rude, just something I picked up as I read this abomination of a post. I didn’t write this post, but I’m going to answer your “helpful” additions. 1. Moffat may not have written the episodes, but he is the co-show runner and ultimately the person who has again and again proved to be problematic both in the running of Sherlock and Doctor Who. 2. We all know why Sherlock faked his death, that is not what this post is about. Charlie was writing about the horrible impacts of making John watch, and the necessity of that fact, and what he thought The Empty Hearse would be like. This was written before The Empty Hearse aired, and speculation about the impacts of grief and emotional abuse on victims. 3. We all know it’s Molly Hooper. Obviously this was a mistake we both missed while proof-reading, and really, does not impact the post at all. Next time you find something we write “an abomination”, I’d really prefer you just close out of the tab and not waste all of our time with your ill-formed responses. I’d like to just add to what Georgie said, now that the episode *has* come out–I never said that Sherlock was doing it to deliberately hurt John, it’s literally nowhere in that post. In The Empty Hearse though, he tries to “surprise” John by revealing that he faked his suicide in a very public, humiliating and clearly triggering fashion, and *then* pretended they were both going to die during the scene in the train carriage, in order that he might get John to forgive him for hurting him in the first place. Which, arguably, yeah, were very deliberate, and part of the cycle of abusive behaviour that necessitated this post in the first place.